Goaltenders are the only ones on the field who can touch the ball with their hands. However they are not allowed to pick up or control the ball with their hands. Hand touches are legal only when in the crease. Each team has a goaltender on the field at all times. A goaltender is required to wear certain protective gear. Every goaltender must wear gloves, a chest protector, a helmet and a throat guard. They optionally wear padded undergarments and a mouth guard, although mouth guards are required in youth levels through high school, as to minimize the amount of concussions and head-related injuries. In women's lacrosse, thigh pads, shin guards and elbow pads are common. Women's lacrosse prohibits jewelry, except for religious purposes. In men's lacrosse, a protective groin cup is required for all players. Goaltenders also have a larger crosse (the head of a lacrosse stick) than the other players. This makes it easier to save shots. The downside is that it can be harder to cradle and pass the ball to another player/teammate. The goaltender's role is to prevent the ball from going into the goal. Primarily, goalies use their stick to block shots. However, it is certainly not uncommon to see a goaltender use his/her body to block the ball as well, such as a chest or leg. The goaltender is capable of committing all fouls. Uniquely, time delay is assessed only when the goaltender maintains possession of the ball for more than four seconds (for men) and ten seconds (for women) while in the crease or fails to clear the ball in the allotted time. The rest of the team must put the ball into play down field in the offensive box within 30 seconds. After leaving the crease with the ball, the goaltender cannot reenter it until they pass the ball. Otherwise it is a turnover at the top of the box. Brett Queener holds the NCAA record for most goals scored by a goaltender with 5 career goals. Cattrano and Brian Dougherty hold the record as a three time Major League Lacrosse Goaltender of the Year Award winner. 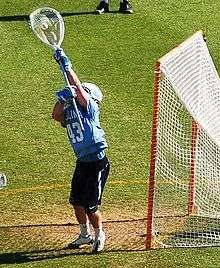 Cattrano is the only goaltender to have won the Major League Lacrosse MVP Award.